One of the toughest things a lot of writers deal with is inspiration. So, today we’re talking inspiration with debut author Shari Schwarz. Her book, TREASURE AT LURE LAKE, releases April 12. To find out more about Shari, visit her website at www.sharischwarz.com. Thanks for having me on the blog today! What an honor! That's a really good question. I have always loved to write. I'd say that the inspiration behind my writing varies. Sometimes I write because I want to express myself, sometimes it's because of an idea or story concept that hits me and I want to explore it to see where it goes. Other times, I'm inspired to write because I want to write for someone in particular. I've also been inspired to write because I was challenged to write something, like for a contest or an assignment. I have four boys, three of them are preteen/teenagers. When I sat down to write TREASURE AT LURE LAKE, I knew I wanted to write a book for my boys. They inspired me to write a book that was full of adventure, something they could relate to, easy to read and something that might capture their hearts and imagination a bit. Tell us a little bit about this book? 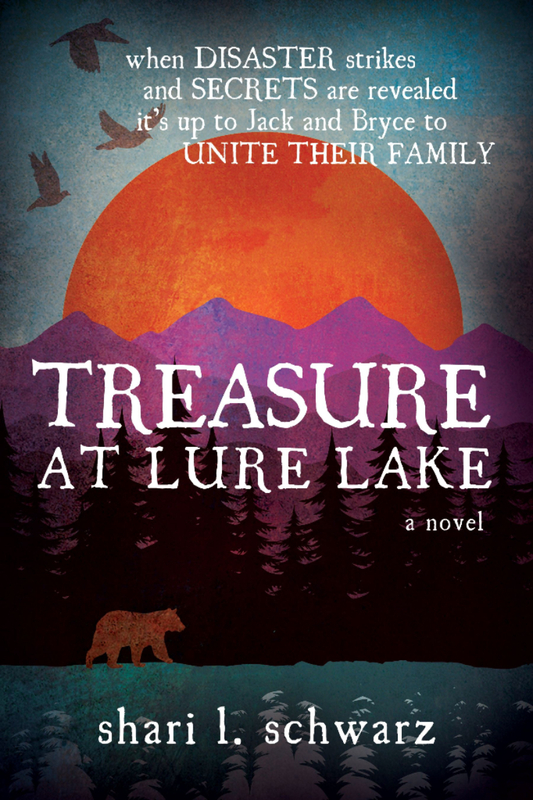 TREASURE AT LURE LAKE is, on the surface, an adventure book where two brothers struggle with the mountain wilderness and with each other to make it out alive and in one piece. 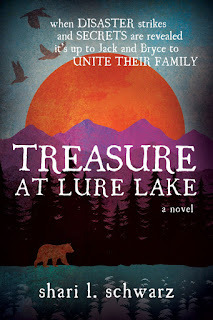 But underneath the exciting events of their journey, there's a family secret that they are also struggling with that is connected to the treasure at Lure Lake. The secret has consequences that make their relationship more difficult than siblings with typical elements of sibling rivalry would endure. Yes, this was the first full book I've written. Several years before I started this one, I had started two YA stories that each only got about a third of the way through. I consider them my warm-ups. What is your favorite thing about the writing process? My favorite thing about the writing process is writing the first draft. I've now written two other books (a MG and a YA) since I wrote TREASURE AT LURE LAKE and I love the creative process and the surprises that happen along the way as you create a new book. I'm a plotter and so I know where my story is going, but each time, I am still so surprised at how things take twists and turns I never would have expected! It comes out April 12th. Very soon! I am actually focusing on my picture books and a chapter book now. My chapter book is a sweet, contemporary about a girl and her dog and selling rocks! Probably the one thing that always does it for me, if I feel like I'm lacking inspiration or a fresh perspective, is to go for a long walk or hike. I find that at about the forty minute mark, my head clears and I start to have new ideas that get me jazzed up for my next project or continuing the one I'm working on. Talking and brainstorming with critique partners is always inspiring as well! I couldn't have written TREASURE AT LURE LAKE without them! Thank you again for having me! This was so much fun!